Not great literature, but as a recovering control-freak, I understand the temptation to try and be the mistress of my own destination/life/story. Little did I know when I married my Englishman … that I’d be transformed into somewhat of a marine enthusiast. I’ve now worked at our small family shipbrokers for over two years. Hubby is convinced that talk about our niche industry is a certain conversation killer, but I’m sure I could wow you at a cocktail party with a few facts and figures provided you have already started on your glass of vin rouge. For instance, you all know the meaning of the radio call ‘Mayday’, but do you know that ‘pan-pan’ is also a distress call of a slightly less urgent nature? (Fact 1) If the deranged fisherman, Quint, in Jaws had not smashed up the VHF radio, the following call could have spared three terrified man a rather large problem. Last weekend Hubby and I went to the Isle of Wight which is situated just off the south coast of England at Portsmouth. We went there to say goodbye to our friend and salty sea dog ex-colleague who is leaving soon on a sailing adventure. The day was all about water thingies: yachts, dinghies, shipwrecks, harbour taxis, WW II sea forts, hovercraft, chain ferries and lighthouses. I’m going to insist on the term ‘thingies’ here as there really isn’t a collective term for them all. They are not all vessels, or boats, nor are they all self-propelled, or mobile and they do not all belong on/in water. The adventure began on the Hoverferry from Portsmouth to Ryde. Did you know that a hovercraft is operated by a pilot, not a captain and is classed as an aircraft and not a vessel? (Fact 2) Once safely on board, you’ll enjoy an ‘air’ safety demonstration including an indication of where to find your nearest exit in the unlikely event of a accident. From Cowes we drove along the beautiful western coastline of IOW to Yarmouth (apparently the lesser Yarmouth, not to be confused with Great Yarmouth in Norfolk). In Yarmouth harbour, our Salty’s Yacht Fathom was moored alongside a smaller yacht called Barbie. Why??? Boat names are funny things. Other vessel names I noted were Lady Sadie, Y Knot, Ferrari, Gemini Twin and Brainwash. But the pièce de résistance … Salty informed us that he’d recently seen Passing Wind. (Fact 4) Hubby and I enjoyed a cup of tea and a tour of Yacht Fathom (including a demonstration of Salty’s sophisticated communications, radar and sound system to accompany him on his 18month trip). Real, born-and-raised Isle-of-Wighters are known as Caulkheads. 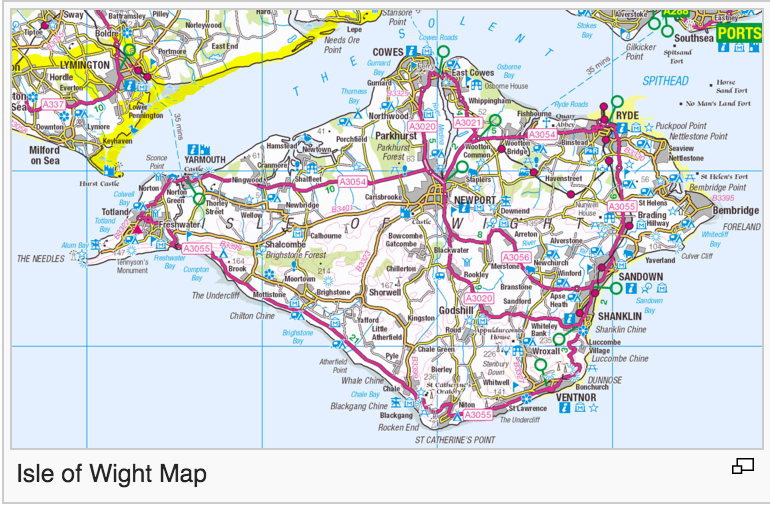 (Fact 5) Caulkheads claim that the IOW is diamond-shaped. Personally, I think it looks more like a sting-ray. You be the judge. 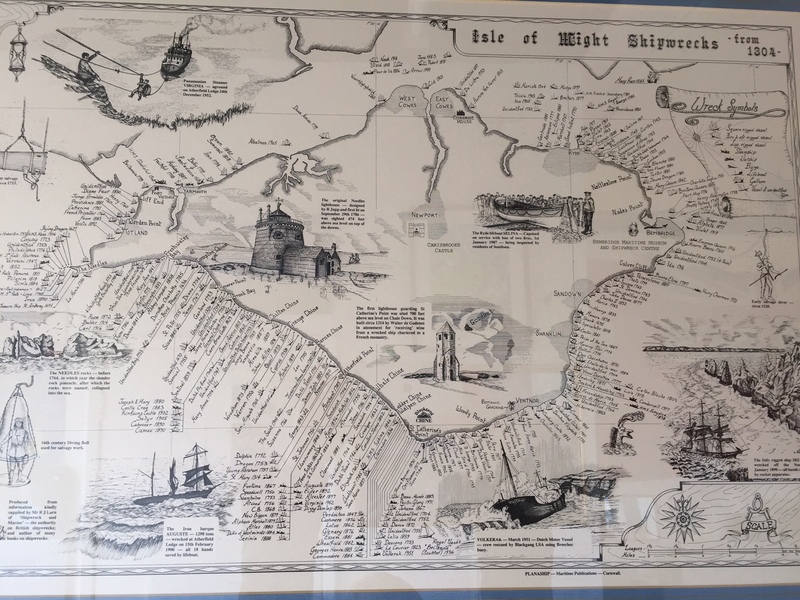 The IOW boasts 67miles (108km) of stunning coastline in the rather precarious position just off England’s south coast in the shipping lanes towards Europe. Shipwrecks were so commonplace in centuries gone by, that the early Caulkheads developed somewhat of a taste for smuggling, marauding and treasure hunting – this was extremely lucrative (Fact 6). In a redemptive twist, IOW-ters now boast one of the most active marine search and rescue agencies in the UK. 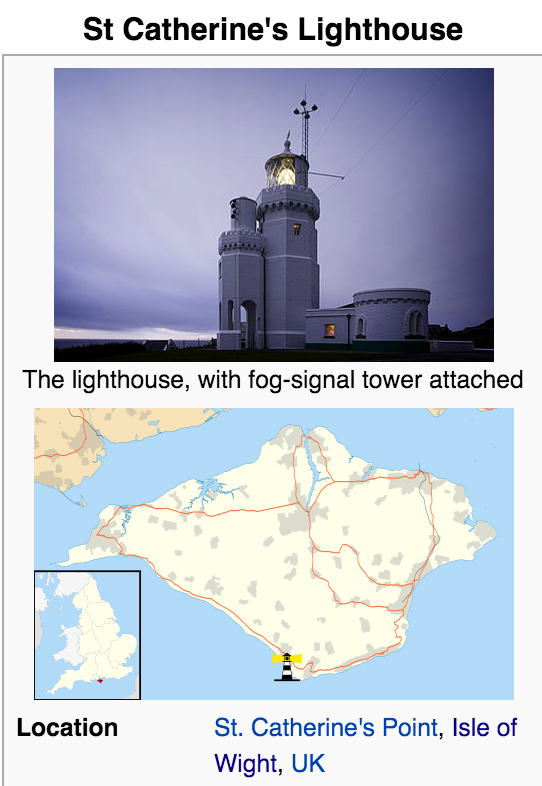 There is now a ‘new’ (1838) lighthouse much closer to the shore. To the absolute delight of the elderly museum volunteer, who I don’t think had had any visitors all day, we took a tour and climbed right to the top – not at all afraid of the steps or the ghost. Finally, on arriving and leaving the IOW at Ryde, there are four very large, strangely-shaped land masses in the middle of the Solent Straight. These are the Palmerston Forts, interestingly named – Spitbank Fort, Horse Sand Fort, St Helen’s Fort and No Mans Land Fort. They were built in the late 1880’s as coastal defences to protect Britain from Napoleon. I’m told they were also used during WW II. They are now privately owned. They can only be reached by boat except for 10 minutes on the lowest point of the spring tide at equinox. 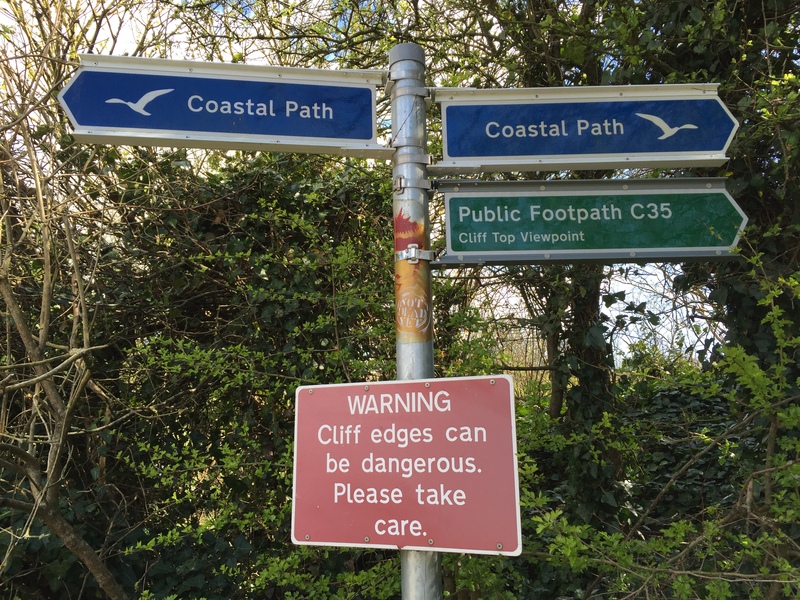 On this one occassion per year, Britons pack their marmite sarnies and walk in their droves across the exposed sand to St Helen’s Fort for a 10 minute picnic. That annual event is now on my ‘to do list’! 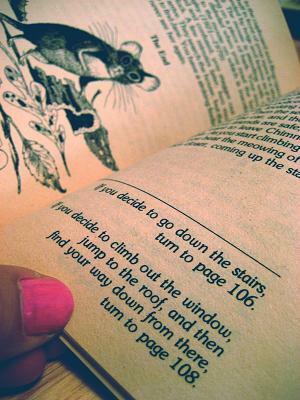 May your life, dear reader, take you down many interesting and unplanned alleyways! P.s. Like mayday (from m’aidez, “help me”), the emergency call pan-pan derives from French. In French, a panne (“pan”) is a breakdown, such as a mechanical failure. A three-letter backronym, “possible assistance needed” or “pay attention now” is derived from “pan”. P.p.s. A backronym is a combination of ‘backward’ and ‘acronym’, and has been defined as a “reverse acronym”, except that the words were chosen to fit the letters rather than the other way around. P.p.p.s. I borrowed the MMSI number (235 762000) from a real vessel, the luxury liner, Queen Mary II. P.p.p.p.s. On the IOW shipwreck map I tried to count and ultimately estimated over 700 shipwrecks noted along the IOW coastline.